When people picture the Northeastern United States, they typically think of one thing: New York City. But while the Big Apple is unquestionably a huge part of the region, the Northeast has so much more to offer. From rolling hills and verdant valleys to sandy beaches and the vast Atlantic, the environment is just as diverse as the people who live here. Stray from the well-trodden path and stay in one of the following Northeast resorts on your next vacation- we guarantee you won't regret it! Popularly seen as one of America’s “Best Inclusive Family Resorts”, Woodloch Resort is a naturally-majestic Poconos paradise. Woodloch operates at all cylinders for all four season, so know that whenever you visit you know you'll be getting their best. Here you'll get traditional warm hospitality, spectacular amenities, and rustic accommodations. Around the resort your family will discover a plethora of things to do and see, from championship golf courses to one of the world’s best destination spas. Away from the resort, you have plenty of options to choose from! Go sightseeing in the Poconos, visit a nearby museum, or participate in some enthralling whitewater rafting.You and your family are guaranteed to be engaged, entertained, and energized after your visit. But most of all, you're guaranteed to leave with a handful of lasting memories! The resort is 7 miles from Ski Big Bear. Amenities include meals (dependent on the plan selected), a championship golf course, an upscale spa (at a sister property) and nightly entertainment. High in the Catskill Mountains, Villa Roma is the perfect retreat for any occasion. That includes fun-filled family weekends! Villa Roma is packed with all the luxury amenities you'd expect from a 5-star hotel, in addition to world-class hospitality. But it's always looking for new and exciting ways to make your vacation even better. Theme nights, including an Italian Street Carnival and Feast every Sunday, are an ever-popular attraction. There's also onsite dining opportunities, golf on the PGA championship course, horseback riding, and paintball. A short drive away your family will love a daytrip rafting on the Delaware River or experiencing NYC, Bethel Woods, or the Monticello Racino! The Resort is nine miles from Bethel Woods Center for the Performing Arts and 19 miles from Monticello Raceway. There are three pools, a hot tub and a spa, and a fitness center has a bowling alley and racquetball courts. Smugglers' Notch Resort is ideal for families of all ages- it's filled with activities designed to bring you closer together and make unforgettable memories! Smugglers’ Notch's mission is to make sure your family has a vacation unlike any other. No matter what season you stay, the family experience is top-notch, and their staff will do everything to make sure you have a superior stay. The lodge offers dedicated children’s programs, designed to be a fun experience, a way of meeting new friends and sharing in an environment of learning and adventure that will help children grow. While the kids enjoy that, parents can take a load off and relax, either out in nature or just enjoying one another's company! Zip line canopy tours and airboarding over the snow are both stupendously popular and for the whole family. In the winter grab some skates and head to the rink or take snow walking tour of the scenic landscape- the immaculate beauty of Vermont will be on full display! The resort is 40 miles from Mount Mansfield and 36 miles from Bingham Falls. Dining options include a cozy restaurant, a grill and a cafe. The first words that greet you on the Northern Outdoors website are "Western Maine is a playground unlike any other". Stay with them for a weekend, and your family will know just what Northern Outdoors means! With Maine’s North Woods flanking, the lodge itself is practically a match in natural beauty. Here you can truly relax and unwind, with the only noise you hear being the wind rustling through the trees. If you'd prefer some life-affirming adventure, your family will love whitewater rafting, hiking, and ATVing or snowmobiling (depending on the season). Meanwhile, inside the resort you'll be subject to unabashed comfort and a deluge of amenities. The pool is always ready for some fun, the Jacuzzi is primed for your sore body, and your taste buds will appreciate a handcrafted Maine microbrew and a tasty bite to eat right onsite! The lodge is 42 miles from Skowhegan. Other amenities include a pool, a hot tub and an arcade, while outdoor activities include hunting, kayaking and snowmobiling. 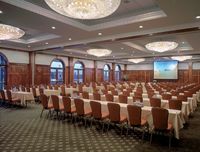 Grab your family and head on over to the beautiful and historic Allenberry Resort and Playhouse in Boiling Springs, Pennsylvania to create unforgettable memories. The beautiful Allenberry Resort and Playhouse is nestled along Yellow Breeches Creek in the Cumberland Valley near the quaint village of Boiling Springs. Choose any of their six private cottages, four lodges, two historic homes, or their restored 1820s limestone mansion, and live the Allenberry experience. Every accommodation features premium bedding, wireless internet, flat screen televisions, and more. At Allenberry, you will find a long year-round list of things to do and see during your stay. You only need to step outside your door to tube, kayak, and fly fish on Yellow Breeches Creek. You and your family can also spend the day hiking the world-famous Appalachian Trail or visiting local cafes and shops in Boiling Springs. Enjoy coffee and scratch breakfast in the mornings at The Breeches Cafe and then get dinner at Allenberry Resort's flagship restaurant The Barn Restaurant, which serves a wide range of delicious fair using seasonal farm-to-table ingredients. Let Railey Mountain Lake Vacations help you find your next vacation accommodation on beautiful Deep Creek Lake in western Maryland. 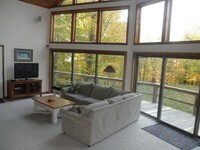 Deep Creek Lake is a fantastic vacation destination, with activities for everyone year-round. Railey Mountain Lake Vacations is the top provider of Deep Creek Lake rentals, with over 450 rental houses, condos, cottages, and cabins that can accommodate any size group. Their Deep Creek rentals come with a wide selection of features and amenities, from private pools and hot tubs to home theaters, game rooms, and fireplaces. If you prefer to be right on the lake with a dock and boat slip or deep in the woods for a more private setting, Railey Mountain has something for you. If you plan to bring your pet you’re in luck! Railey Mountain has over 100 dog-friendly rental homes. You’ll have no problem finding things to do with your family in the area. Go hiking at Deep Creek State Park, explore Deep Creek Lake via kayaking, or combine family fun with fitness at Splash Island’s inflatable watercourse. Check out downtown Oakland for antique shopping, explore over 200 years of history at the Garrett County Historical Museum, catch a show at Our Town Community Theatre, and more! From your cozy Killington Rental Associates property you'll have easy access to Killington's diverse array of fun activities and attractions, whilst staying ins superior comfort! Killington is home to some of the finest ski resorts in the Eastern United States. But regardless of the season you visit, you'll find something fun for you and your family to do! Besides skiing, in the winter there's sleigh rides, theater, shopping, snow-tubing, and snow snowmobiling galore! As if that wasn't enough, there's also ice skating and indoor rock climbing if you need a break from the outdoors. When summer rolls around, you'll want to explore the beautiful natural surroundings on a hike! There are several incredible Green Mountain hiking trails in the area- take a guided tour hiking the Appalachian or Long Trail and make some memories! The population of Killington was 811 at the 2010 census. The town of Killington was chartered on July 7, 1761 by a New Hampshire grant. Mohonk Mountain House looks like a Victorian castle. Perhaps it's only fitting that you're treated like royalty inside! Lake Mohonk makes for an absolutely stunning background for any occasion, but your family will truly appreciate it on your next vacation. The carefully landscaped gardens and pristine wilderness/ of New Platz are perfect for folks seeking tranquil relaxation, while the lake has plenty in the way of swimming, boating, and other sports activities. Inside you'll be treated to Mohonk's warm interior, filled extensive woodwork, fireplaces constructed from Shawangunk stone, period accents, and expansive windows that frame the breathtaking scenery. While the kids run around in the beautiful outdoors, you'll be relaxing in style! The Resort is 90 miles north of New York City. Founded by Albert Smiley in 1869, Mohonk Mountain House is a National Historic Landmark that must be seen to be believed! With a luxurious Main Lodge and 35 cottages nestled amid 125 acres of pine forest, Migis Lodge is a nature-lovers paradise. Show your family what appreciating the outdoors is all about! Walk along the 3,500 feet of Sebago Lake shoreline and you'll see why Migis' guests return year after year, generation after generation. Active families will find a lot to love, from playing tennis and waterskiing to kayaking and sailing, there's always something to do around the resort. While the kids are off having the time of their lives, treat yourself to a massage at the wellness center or just lay on the beach and catch some rays! The Lodge has been open since 1916! Freebies include all meals, plus activities like tennis, waterskiing, canoeing, kayaking and a kids' camp. Spring, summer, fall or winter, Crystal Springs Resort is a stupendous place to make some unforgettable family memories! The AAA 4-Diamond Grand Cascades Lodge, while striking from the outside, oozes class, sophistication, and comfort within. It strikes a perfect balance between man-made luxury and natural beauty- which you'll find plenty of just steps from the resort! Opportunities for fun are endless: horseback riding up the mountain, trying your hand at some golf on one of the six courses, or diving into the crystal clear water the resort's own biosphere. Superb hospitality and attention to detail pervade every inch of Crystal Springs; treat your family to it on your next trip! There's also a pool complex with hot tubs and saunas, and a spa, plus laundry service and a business center. The resort is set less than a mile from Highway 94 and 4 miles from Mountain Creek ski area. Nestled in the beautiful rolling hills of Vermont, near the border of Quebec, lies a historic family-friendly lodge with breathtaking views and charming 100-year-old cottages. Pack the kids in the RV and start driving north to Quimby Country Lodge & Cottages, because this quaint camp is truly a one-in-a-million hidden gem. Quimby Country Lodge is perhaps best known for its expansive, one-week, all-inclusive family vacation packages. Stay in a private cottage equipped with a wood stove and rustic porch. Take advantage of complimentary canoes, kayaks, paddle boats and motorboats. Enjoy meals in the dining room as well as lakeside barbecue and lobster bake. Try your hand at archery, sailing, arts and crafts or gather the troops for the famous Quimby Family Olympics! The fall foliage season is an absolute must in this part of the world. The sprawling, rolling hills turn an incredible orange and the air tastes a little crisper. Regardless of season, these hills are known for moose sightings and bird watching. Go for a swim, spend an afternoon fishing or take a canoe out on Forest lake. The Northern Vermont wilderness is stiflingly beautiful. Quimby Country Lodge & Cottages was originally named “The Cold Spring House” when the doors first opened to guests in the summer of 1893. Charles Quimby, a tinsmith from New Hampshire, first owned the property and believed the mineral spring had healing powers. Winter Clove Inn provides the peak of family fun in the scenic Catskills! A mountain of onsite fun and mountain adventures just outside your door provide adventures for all ages while the Inn itself is the perfect place to unwind after an action-packed day! Family fun is a tradition here, a tradition you'll become a part of the moment you enter the property. Once you step foot on the wrap-around porch and walk through the doorway, you’re transported to a time where the Colonial ideals of home and family took prominence. The family fun begins onsite, where both indoor and outdoor swimming pools, a tennis court, a playground, a basketball hoop, and an antique bowling alley await. The hiking trails, a nine-hole executive golf course, and 15 kilometers of cross country skiing trails add to the adventure. When you're ready to unwind, sit back and admire the majesty of the onsite waterfall before retreating to your room. Located next to the outdoor swimming pool, the Oaks Lodge has a friendly and familiar comfort in its size that makes it a very attractive option in the summer months. With two common areas on each floor (and a TV/DVD player and mini-fridge in each), as well as multiple outdoor gathering areas, the Oaks Lodge is tailor-made for families of all sizes. Family fun abounds here! The Carriage House is three-bedroom suite with two baths and a cozy gathering area, perfect for small groups wanting to vacation privately and stylishly. Plenty of adventures beckon just off the property. Stop by the Howe Caverns, Zoom Flume waterpark, or New York Zipline Adventure Tours! Cozy and all-inclusive are understatements when it comes to Tyler Place Family Resort. Here the only thing you'll have to worry about is when you have to leave! Tyler Place Family Resort has been a family-friendly destination for five generations- they obviously know what families are looking for. Here, your family will find comfy rooms, beautiful scenery, and award-winning kids programs! While they're off having the times of their lives, the parents can spend their time however they wish. Relax or get out and get active- it's totally up to you! The resort is only eight miles from the Missisquoi National Wildlife Refuge! There's also a bar, indoor and outdoor heated pools, plus an arts and crafts studio, and a game room. Despite its name, Rocking Horse Ranch Resort is more than just horses- it's the most fun your family will ever have! Rocking Horse's sprawling 500-acre property and beautiful private lake provides a scenic backdrop for an absolutely unforgettable family vacation. Here, your mind can be at ease- the little things will be taken care of. Hungry? Your family will love the three delicious all-you-can-eat meals daily. Have no plans for the night? The Resort regularly attracts top-name entertainment, including magicians, comedians, jugglers, and circus acts from around the world. And when you're all tuckered out, get cozy in Rocking Horse's luxury rooms and get recharged for day two! The resort is five miles from I-87 and six miles from the Poughkeepsie train station. Outdoor activities range from horseback riding, water sports on the lake and skiing, to mini-golf, tennis and basketball. What better place to reconnect with your family than on the beaches of Cape Cod? With Beach Realty you can easily choose the perfect place to stay that meets all of your needs! Cape Cod is surrounded by water, so when you stay at Beach Realty, you'll feel like you're on your own private island! Enjoy fishing and boating during the day, keep your eyes out for seashells, or build a sandcastle with the kids. Beach Realty’s spacious vacation homes and cottages offer multiple bedrooms and baths, full kitchens, cable television with DVD player, and much more that will make you feel right at home. Some accommodations even allow pets so you don't have to leave any member of the family at home! Enjoy quality time with your loved ones as you lounge on the beach, swim in the water, or explore the Cape Cod area! With vacation rentals at East Sandwich Beach, Sandwich Downs, Sandy Neck Beach, Town Neck Beach, and much more, your Cape Cod getaway will be spent catching a tan with your toes in the sand! Cape Cod is the perfection location to cast your line. Head to one of the many beaches, like East Sandwich Beach, Sandwich Downs, Sandy Neck Beach, or Town Neck Beach or charter a fishing boat! Taylor-Made Deep Creek is four seasons of activities and adventure, wrapped in a spectacularly comfortable wrapper! Whether you're exploring the coastline on a jet ski for some high-speed excitement, or taking a fishing tour with one of the local guides, you're going to have an unforgettable time! There's just so much to do! Tackle the rapids at the Adventure Sports Center's man-made white water rafting course or brave some of the nation's top rivers with local rafting companies in summer. Winter allows for skiing, snowboarding, ice skating and so much more! Go have a blast, then when you're all tuckered out return to your exceedingly cozy home. You'll swear your rental was tailor made for you! Deep Creek Lake covers approximately 3,900 acres and has 69 miles of shoreline. Pine Ridge Dude Ranch in Kerhonkson, New York is an all-inclusive, affordable family vacation destination. Set in the beautiful foothills of the spectacular Catskill Mountains, Pine Ridge offers stunning mountain views, as well as spacious and cozy accommodations. Their Western horses ride over miles of wooded trails that overlook the scenic Shawangunk Ridge with views of the Mohonk Mountain. For safety of all the riders, each trail ride is accompanied by several experienced wranglers. The heart of the ranch is their unique approach to horses for both riders and non-riders. They give their guests the opportunity to ride all day or just enjoy watching the horses in the field. Pine Ridge offers a first-class riding program at affordable rates and features trail rides for riders of all levels, including beginner, intermediate, and advanced. Pine Ridge makes sure to accommodate the younger horse-lovers, offering one free pony ride per day for children six and under, corral lessons for kids ages five to eight, and a Barn Buddies program. Pine Ridge doesn’t just have horses, the resort also features tractor rides, paintball, an indoor and outdoor pool, a petting zoo, and much more! Don't miss the opportunity to participate in the Pine Ridge Dude Ranch program Own A Horse for the Day. Before buying your child a horse, have them try and take care of one for a day at Pine Ridge. Just some of what they will learn about is feeding, grooming, saddling, and riding. Pine Ridge's herd consists of a mix of different breeds such as: Quarter Horses, Thoroughbreds, Appaloosas, Paints, Percherons, Clydesdales, Haflingers, Icelandics, Morgans and Arabians. 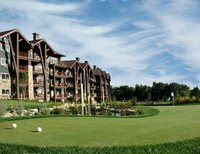 Split Rock Resort is a four season, family-friendly resort where families have been making memories for generations. Yours could (and should) be next! There's a seemingly endless cornucopia of things to do in and around the resort for families. The H2Oooohh! Indoor Waterpark, redemption Arcade, eight lanes of Cosmic Bowling, and onsite movie theater, give you unparalleled options for fun. Outside you'll bond over hiking, biking, kayaking, or skiing at Jack Frost and Big Boulder in the winter. If you're exhausted from all the fun, slide into a hot tub while the kids swim at the indoor pool, or get pampered with an on-site massage! The Resort is 4.2 miles from Jack Frost Big Boulder Ski Area and 6.1 miles from I-80. Dining options include an Italian restaurant and a sports bar. 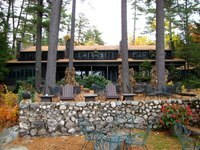 A Skytop institution since 1928, Skytop Lodge is 5,500-acres of unforgettable family memories. They mean it when they incite you to "Discover the Poconos you never knew existed"! If you're looking for an array of options in which your family can participate, look no further than Skytop Lodge. Here you'll find the ultimate Poconos playground, somewhere you can play a round of golf, go on an outdoor adventure, and scale a rock-climbing wall all in the same day! There's an Old Western-themed paintball course, a Treetop zipline and challenge course, and enough luxury amenities to satiate the Queen herself! Whatever you feel like doing, the friendly staff at Skytop will do everything they can to facilitate an incredible experience! The Lodge is 1.2 miles from I-84 and 52.5 miles from Lehigh Valley International Airport. There's an 18-hole golf course, indoor and outdoor pools, and a lake, along with trails, tennis and ziplining.